Will donating your airline miles help gay & bi men in Chechnya? Three groups that aim to help bisexual and gay men escape Chechnya have pooled their efforts in a new fundraising endeavor that collects unused airline miles. Donated miles go into an account with the Quebec company Aeroplan, which supports more than 300 non-profit causes like Doctors Without Borders, the Down Syndrome Research Foundation and Rainbow Railroad. And that support, said a spokesperson, includes every single mile. “One hundred percent of the miles donated go directly to the organization,” Aeroplan spokesperson Christa Poole told LGBTQ Nation. According to Gay Star News, Rainbow Railroad joined forces with the Russian LGBT Network and a nonprofit called All Out, in order to book airline mileage award tickets for asylum seekers through Aeroplan. Currently, 30 LGBTQ people from Chechnya are being held in a safe house in Russia, according to reports, and once they’re cleared to leave the country, Rainbow Railroad will book award tickets to fly them to another country where they can seek asylum. Members can use Aeroplan Miles to support registered community charities or provide travel assistance for people and their families with medical or other emergencies. An account is established in the name of the charity, which enables them to pool donated Aeroplan Miles at no cost. Aeroplan Members can donate miles online at www.aeroplan.com/donate. To date, Aeroplan Members have donated an outstanding more than 640 million miles. As of press time, more than 3 million miles have been donated to this cause, in amounts ranging from a few thousand to more than 239-thousand from a single donor in Florida. So far only two countries have agreed to take in gay and bisexual men fleeing abuse in Chechnya: Lithuania and France. Lithuania granted asylum to two Chechen men earlier this month, and earlier this week it was announced that France had taken in its first gay Chechen. The United States is reportedly not granting visas to the men. 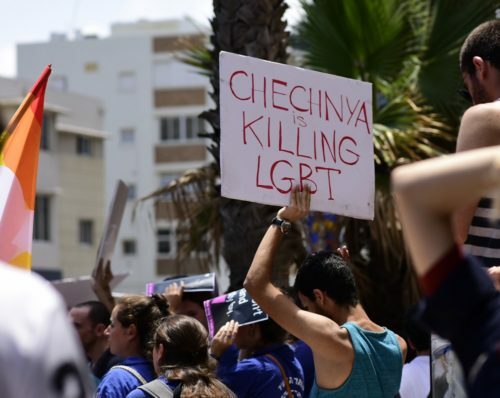 As of last week, at least 26 gay and bisexual men have been killed in Chechnya because of their sexual orientation, reports Novaya Gazeta, the Russian newspaper that broke the story about the detentions, torture and abuse of more than 100 men believed to be gay or bi.